I performed a pre purchase inspection on this very original 1974 Porsche 911 Carrera at last year Auctions America California event in Santa Monica, This was a US delivery car that was ordered with the Carrera option. In the US, this was all cosmetic and had the appearance the Carrera RS and the Euro Spec 2.7 MFI Carrera’s. The body on the car had the larger style fender flares of the RS, which came to be what was used on all 911’s starting with the SC cars. The rear quarters were different from the RS and can be seen pretty easily on the lip of the wheel opening. The width of the lip on a RS is about twice as wide as that of a Carrera. 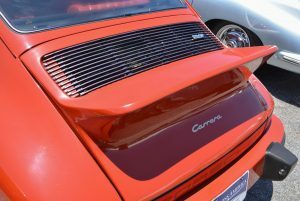 The Carrera carried over a $4,000 to a 911S. The Carrera’s came with several standard items. The spoiler and safety graphics were this cars only options. This example was well documented and was almost completely original. The car was finished in Peru Red with Russet Leatherette. I found the paint and interior to be original, the body was excellent, engine and gearbox original to the car. There was plenty of patina to go around, but a very nice original example. This car was featured by Excellence magazine in 2003 and was awarded a 1st place in PCA’s Preservation Class, as well as Honorary Judges Choice awards. The car was loaded with documentation, original window sticker, air pump, tools, service history, ownership history, and an old COA. I bid this car to $100,000 on my clients behalf, and ultimately the car fell short of the sellers reserve with a high bid of $110,000. On paper, this car should have done the money, but I think the color combination hurt this car in the auction. I know that my client struggled with it and let it go because of it. I preform Car Appraisals and Pre Purchase Inspections throughout the United States with our regular service area being Florida, Georgia, Mississippi, Alabama, and South Carolina. I travel extensively throughout the United States and Canada. I am in attendance at many of the collector car auctions throughout the United States such as Mecum, RM Sotheby’s, Gooding & Co, Auctions America, Bonhams, Barrett-Jackson, and Russo and Steele. If you are considering the purchase of a special interest car, contact us to inspect the vehicle for you. Our inspections can be performed in most cases within 24 hours. Contact us today at 772.621.2622 to discuss your needs or use our online Pre Purchase Inspection Request Form.